When teaching little ones about the Bible, it's always nice to add a little fun to the mix. This not only keeps kids coming back for more, but also helps them retain information as they learn it. My son especially enjoys when we have a scavenger hunt or play a good game of memory after we've completed a Bible study session. 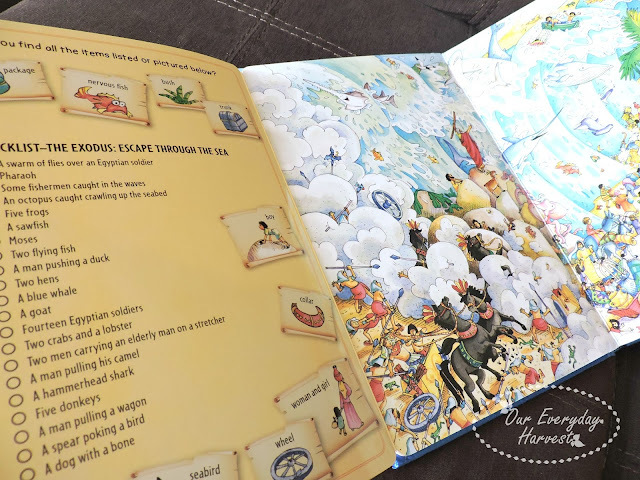 The latest Look & Find Bible Storybook from B&H Publishing takes two of the things we personally enjoy doing, studying Bible stories and scavenger hunts, and combines them together in a really neat flap book. Interacting with Scripture can be lots of fun with the Look & Find Bible Storybook. Learn about Creation, Noah's Ark, the exodus, David & Goliath, Jonah, Jesus' birth, Jesus' miracle of feeding the 5000, and Easter and the ascension. Then open the large flaps to explore each story's scene and reveal a look-and-find checklist. We are no stranger to look and find books, in fact, my son has quite a collection. We enjoy sitting on the couch together, as I ask him to locate certain items on illustrated pages with–let's just say–a lot going on. The Look & Find Storybook is really nice for younger children, since it's an actual board book with sturdy pages that can withstand tearing. The difference between this board book when compared to others is that it is rather large in size, with the dimensions being a little over 8x12 inches. Since the pages are rather large, each story contains a block of lengthy text on one page, but everything is paraphrased from original Bible content in order to offer a more age-appropriate version of each story. Besides the retelling of eight awesome Bible stories, the highlight of this book is the chance for kids to have some interactive fun. The story page is an actual flap that opens up to reveal quite the impressive spread of illustrations. The left side of the page contains a picture and text checklist that challenges children to find the items on the next two pages–think Where's Waldo meets Bible stories. We have another book that's quite similar to this one where it offers a search and find activity that also correlates with Biblical tales, and my son likes it quite a bit. Needless to say, he is really enjoying this one, too. There's a good mix of objects that need to be located on each two-page spread, some of them smaller in size, while others are much larger. This makes it fun for younger ages, as well as children who are more seasoned in their search and find games and prefer more of a challenge. The illustrations are fun and there is definitely a lot to see! We often go through the checklist of objects that need to be found, but to expand the game, I also like to throw in a few more items from the picture that are not necessarily mentioned on the checklist. Another neat thing about this book is that you can actually use a dry erase marker with it, so if you have children who would much rather circle the items they find instead of just pointing them out, they have the option to do so. 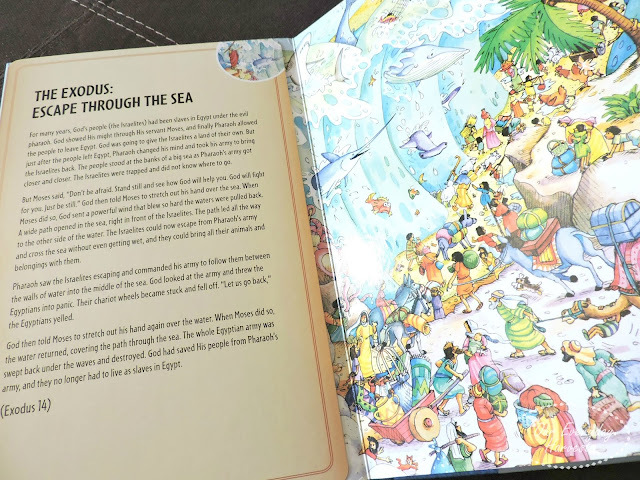 If your children enjoy search and find games, and you're looking to get them more excited about reading Bible stories, then the Look & Find Bible Storybook is definitely one to add to the wishlist. Although this has board book pages, which are nice for really young children, the quantity of text, coupled with the search and find games makes this a great book that's be suitable for a broad age group. The recommended ages listed are preschool through third grade, and I would say this is a pretty accurate range. For more information on the Look & Find Bible Storybook and other Christian titles for children, be sure to visit B&H Kids on Twitter and Facebook.